Although the purpose of marketing is the same as it ever was — connecting a company with its customers — the actual engine of marketing is in the process of being rebuilt from the ground up. Same shiny, red car on the outside, but a radically new engine under the hood, running at a different speed, on different fuel. So how exactly do you rebuild that engine in your organization? If you’re a B2B marketer, Adam Needles has just published the manual you’ll want to have in your shop, Balancing the Demand Equation: The Elements of a Successful, Modern B2B Demand Generation Model. 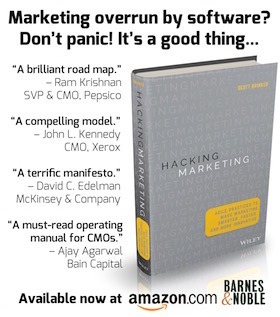 Second, a blueprint for managing this new kind of marketing within your organization. Adam emphasizes two shifts required in marketing management: (1) a focus on “educating” prospects, rather than “selling” to them; and (2) adopting an “operations mindset” in the structure and flow of these reframed customer interactions — with particular consideration paid to the middle-of-the-funnel. That first shift is the foundation of content marketing. But the second, which has received far less attention than it deserves, is the heart of the new wave of marketing operations. For the mere price of a book, it’s a bargain to tap into Adam’s experienced and inspiring thinking on these topics.